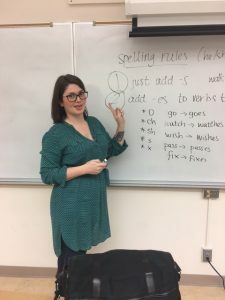 Shannon Ball graduated from LTS in 2014 with a focus on teaching English. Her MA Project was titled Teaching Adult Community ESL through Children’s Literature and she now works full time at Lane Community College in Eugene, Oregon. Shannon is an example of someone whose MA Project focus led her directly to a position that allows her to apply what she learned and created. I work at Lane Community College as an ESL instructor, an ESL Student Services Specialist, and an ESL Assessment Specialist. I love doing all of these jobs, because I get to know ALL of the students in the program, and not just the ones in my classes. I usually teach the low-beginning levels, but am currently teaching Writing and Grammar C, which is the third level of six in our Main Campus IEP. I love every minute of it! Just one thing?! I could really go on and on about what I like best about this job. The reason I got into this work in the first place was that I have a strong desire to contribute meaningfully to my community. The people who come through our program are active members of our community, and the benefits of their enrollment in our program are innumerable. When our students learn, they help other similar members of the community (their friends and family) by teaching them what they have learned and by encouraging them to come to the program as well. They get better jobs, which helps their families and the economy. They are able to participate more fully in the English-based education of their children by communicating better with teachers and engaging and helping with their school work. The effects go on and on. Another thing that I love about teaching to this community is that they come in highly motivated. They are so eager to learn, and to share what they already know with each other. I also love watching the relationships that my students develop. I had a couple of students last year who were different in every way: age (one was 21 and the other 63), culture, country of origin, L1, etc. But they sat together and helped each other in class, studied together after class, and spent time together on weekends, and the most amazing thing is knowing they are using English the whole time because it is their only common language. It’s a truly authentic application of the things they learn in the program, and it motivates them to learn even more! I think the most valuable thing I learned and honed in the program was to connect every aspect of your lessons to a common purpose or objective. Always asking, and encouraging your students to ask, why you are doing a certain activity promotes active learning. Class time seems so limited that you need to plan well and make the most of every minute! Take every opportunity you possibly can to volunteer, intern, or do a graduate teaching fellowship while you are in school. I know grad school is a very busy time, but this can both valuably inform your coursework and provide authentic hands-on experience. A lot of US schools tend to require a minimum of two years of classroom teaching experience, so it is also good for your resume! My other piece of advice is to make the program work for you. LTS is such a flexible program and really allows for creativity and encourages innovation. If you have an idea, go for it!